Jeep Gladiator is a new name for adventure, Jeep says. And after the years of rumors and expectations, the last year redesigned Jeep Wrangel has finally got the truck-bodied counterpart. 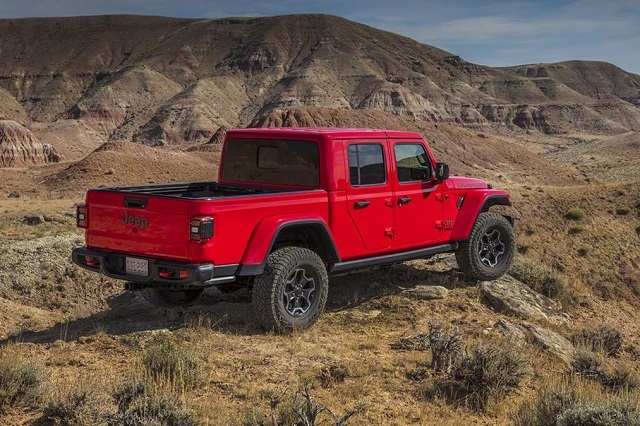 The model debuted at the 2018 Los Angeles Show and goes on sale in late 2019 as the 2020 Jeep Gladiator while the buyers on the Old Continent have to wait until 2020 for their adventure. The all-new Gladiator is a unique design among the trucks and Jeep promises the class-best towing and loading capability while the brand’s fabled off-road capability will now be embodied in the mid-size pickup form. The truck will arrive in the single cab and bed style and debut also with the V-6 engine with the arrival of the diesel option in 2020. Jeep will also offer the limited number of the trim options initially while should broaden the range in years to come. Buyers will choose from the Sport, Overland and Rubicon versions. Design-wise, the new 2020 Jeep Gladiator is what we expected, the truck-bodied Wrangler Unlimited. But it wasn’t an easy job for the Jeep to make the transformation. The pickup truck is body-on-frame design with the strengthened and lengthened chassis compared to the Wrangler SUV. The Gladiator measures 218 inches in total which makes it 30 inches longer than the Wrangler Unlimited. The wheelbase of the model has 137.3 inches, 19 more than the biggest Wrangler and around 10 inches longer than the rival, mid-size models. There are more impressive numbers of the new Gladiator. The truck posses 30-inch water fording capability, 11.1 inches of the ground clearance, 43.6 degrees approach angle, 26-degree departure angle and 20.3-degree break-over angle. Visually, the model shares the design cues with the Wrangler SUV. The truck comes with the signature seven-slot grille but with slightly wider slots for the better airflow and more angled nose. The model arrives with the hard and soft tops and removable doors while the windshield can be folded flat. The Gladiator comes with the crew-cab style only and short 5-foot cargo bed. Inside the cabin, the convertible, mid-size truck uses the same design language as the Wrangler SUV. The dashboard is a familiar style with the upright design and signature, circular air vents. The model has a 5.0- inch standard center screen on the Sports trim and standard air conditioning. The upgraded infotainment 7-inch screen with the Apple Car Paly and Android Auto is optional. The options also include the power windows, Alpine sound system, heated seats, etc. The Overland trim improves with the 8.4-inch screen, leather upholstery, three-piece removable top, and advanced safety equipment. The automatic emergency braking isn’t in the list but the model packs forward collision warning, adaptive cruise control and blind spot monitors. The Rubicon version prioritizes, of course, the off-road capability by adding the locking differentials, wider axles, lifted suspension, all-terrain tires, etc. In the engine department, the 2020 Jeep Gladiator doesn’t offer the turbocharged four-cylinder engine or the mild-hybrid setup. Jeep debuts the mighty Gladiator with the single engine option. The familiar 3.6-liter Pentastar V-6 will provide 285 horsepower and torque of 260 pound-feet. The transmission options include the 6-speed manual and 8-speed automatic setup. Jeep announced the arrival of the turbodiesel unit in 2020. A 3.0-liter turbodiesel V-6 will make 220 hp and torque of 442 lb-ft. Jeep will pair this engine with the 8-speed automatic gearbox. The Gladiator uses the Command Trac 4×4 system with the two-speed transfer case combined with the Dana 44 front and rear axles by default. The Rubicon boosts the off-road capability with the Rock-Trak system and low-ratio drive and Tru-Loc locking differentials. The Rubicon has also the 33-inch all-terrain tires and electronic disconnecting sway bars. The new mid-size Gladiator claims also the class-best towing and loading capability. Jeep promises the loading capability of up to 1600 pounds while the towing limit rates at 7, 600 pounds. 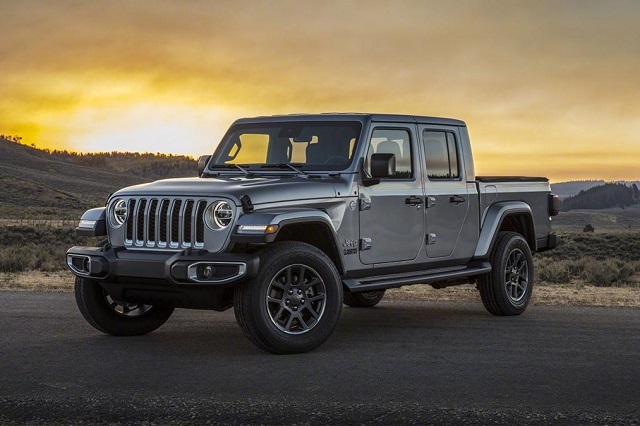 The production of the new 2020 Jeep Gladiator starts in the first half of 2019 while will go on sale in the second part of the year. In Europe, the on-sale date will be in 2020. The price remains unknown until closer to the launch date but obviously, the Gladiator will cost more than the Wrangler’s analogs. The Wrangler starts from $28, 000 and the fully-loaded Rubicon goes over $57, 000. The Gladiator will likely hit above $60, 000 in the best-equipped version reaching possibly $70, 000.